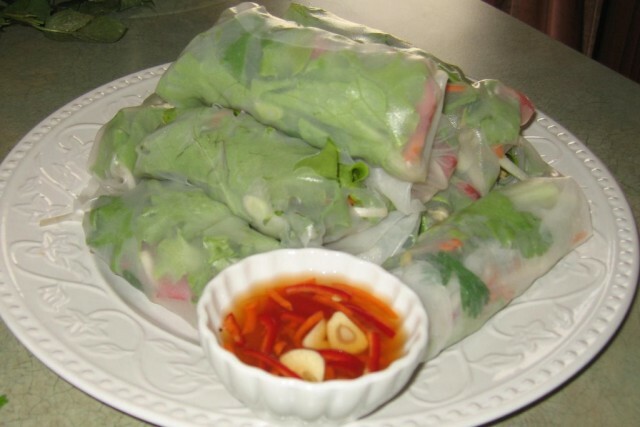 Let the rice paper soak in a bowl of cold water until soft and pillowy then remove and assemble rolls (lettuce, meat, bean sprouts, carrots, cucumber, cilantro and then green onions). Best if rolled and served immediately. If you want to chill for later, dampen a paper towel and place over top. Stir in the sugar until it is dissolved. Mix all together and let stand at least 30 min, or until ready to use.